Oftentimes, it’s either the fans or the executives at Sony or Microsoft that try to throw shade at each other. This time though, it was whoever is handling the Detroit: Become Human Twitter account. The tweet obviously throws shade at Xbox owners who won’t be able to play the game on the Microsoft console, unless they also own a PS4. As expected, the tweet was eventually deleted some time later (around three hours later according to Eurogamer). 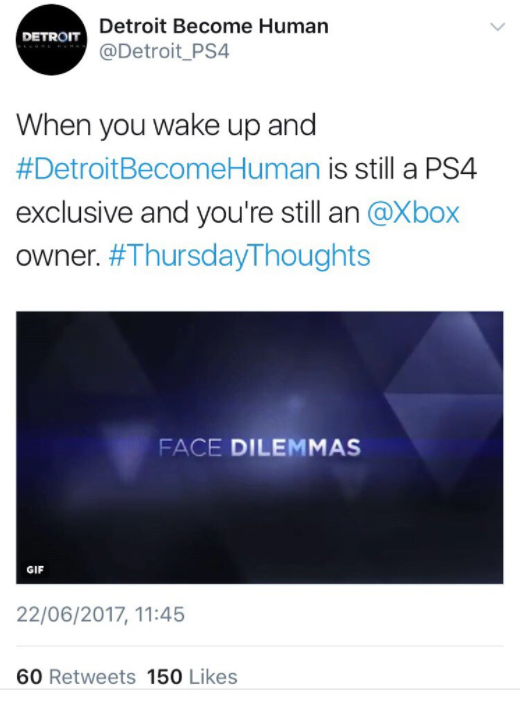 There’s a chance that whoever is handling the account meant to post the tweet on his or her personal Twitter account but ended up publishing it on the Detroit: Become Human account instead. We might never know as we probably won’t get an explanation for the incident. Detroid: Become Human is schedule for release exclusively on the PlayStation 4 sometime in 2018.